The Word Pyramid is a fun puzzle that is often found in magazines and on puzzle programs on the TV. You start with a short word and add one extra letter time, to create an anagram of the existing letters and the new letter. The example word pyramid image solution shows how the puzzle works. The aim is to get from the start to the end of the puzzle, using the clues that appear alongside each step of the pyramid to help you, together with your knowledge that the next answer is an anagram of the previous clue plus one new letter. Word pyramid puzzles are good fun and a challenge for both the adult and childrens audience, depending on the difficulty of the words and anagrams that are required to complete the pyramid successfully. 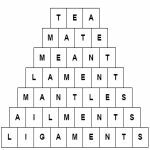 We can supply word pyramid puzzles in a variety of sizes; the standard puzzle starts with three letter words and moves up to nine letter words, however if you require we can create puzzles with longer words; just let us know your requirements. Click to view a sample Word Pyramid puzzle in PDF format. All puzzles for publication come in your choice of PDF or EPS format and come presented in the format of a pyramid complete with solution ready for print publication.